Are you a French fries person or an onion rings person? I’m almost always a French fries person, for the most part because I forget to actually check out other options. When I order a sandwich or burger at a restaurant, they usually ask “are fries okay with that?” and I always oblige with a “yes”. The only exception to the rule is whenever I go to Outback (which, incidentally, hasn’t happened in at least five years), where I always order a bloomin’ onion. Here’s the thing… onion rings are awesome. Yes, they usually take a back seat to French fries, but they are a totally worthy side dish (or appetizer, or snack). 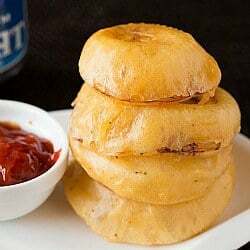 While I’ve dabbled in baked onion rings before, I was really yearning to make some honest-to-goodness, beer-battered onion rings. They’re not hard to make, and I estimate that they’re better than 98% of the onion rings I’ve ever eaten. Scouts honor. 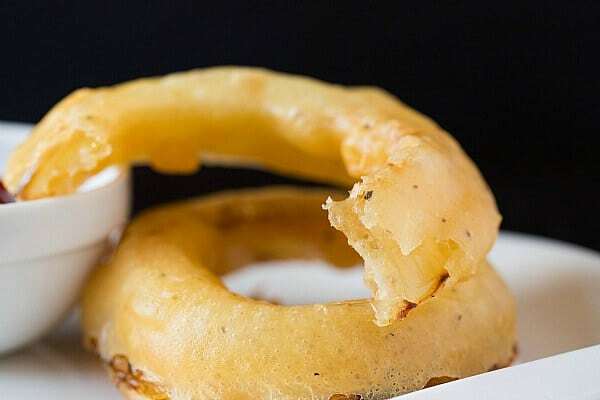 To make these onion rings, you first soak the onions in a mixture of beer, vinegar and seasonings, which softens the onions and mellows the raw flavor so the onion rings aren’t so pungent when you bite into them. Then a simple batter is whisked together, the onion rings are dipped, fried and drained! It’s an incredibly simple process and the result is infinitely better than any take-out onion rings I’ve eaten. 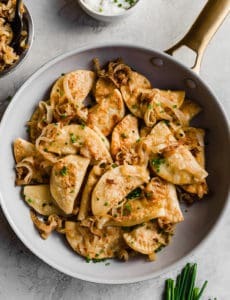 The onions are tender with a subtle flavor, while the crisp exterior is really what shines. They’re incredibly crunchy, yet the coating is thin and crisp. The best part? 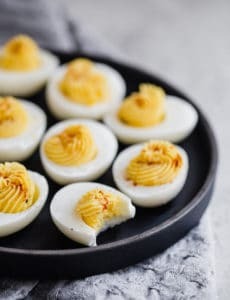 When you bite into these, everything stays together! How many times have you bitten into an onion ring only to inadvertently pull the entire onion out of the crust in the first bite? 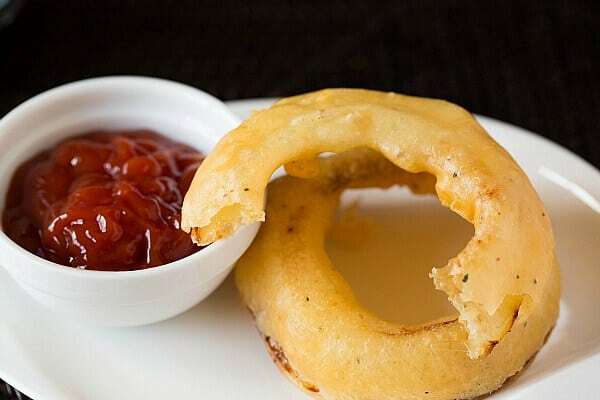 When I say perfect onion rings, I definitely mean perfect! You can eat them with ketchup or your favorite dipping sauce; I’m partial to this Outback Bloomin’ Onion dipping sauce recipe. I’ve vowed to myself to start trying out onion rings on a more regular basis. Maybe I’ll strike a happy balance between them and French fries, after all! 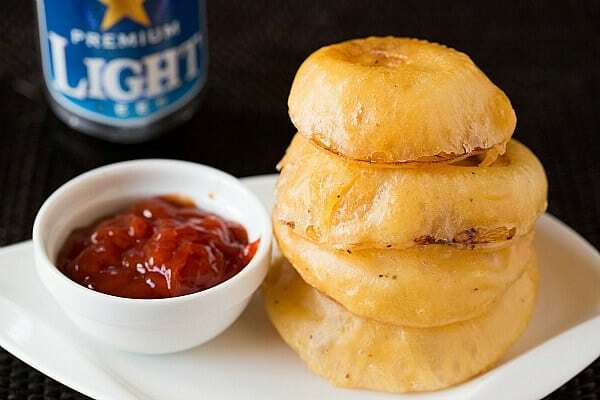 Perfectly crunchy beer-battered onion rings. Serve alongside your favorite burger or all by themselves for game day food. In a large, resealable plastic bag, place the onions, 2 cups of the beer, the vinegar, ½ teaspoon of the salt and ½ teaspoon of the pepper. Seal the bag and refrigerate for at least 30 minutes, or up to 2 hours (do not leave them for more than 2 hours, as the onions will get soggy). Add the oil to a large Dutch oven or heavy-bottomed pot (it should come to a depth of about 2 inches). Heat the oil over medium-high heat to 350 degrees F. Line a baking sheet with a double layer of paper towels and set aside. While the oil is heating, prepare the batter. In a large bowl, whisk together the flour, cornstarch, baking powder, remaining ½ teaspoon salt and ¼ teaspoon pepper. Slowly whisk in ¾ cup of the remaining beer until just combined (the batter will be lumpy). Whisk in remaining beer, if needed, 1 tablespoon at a time. The batter should fall from the whisk in a steady stream and leave a slight trail across the batter. Remove the onions from the beer marinade, separate into rings and pat dry with paper towels. (Be sure that the onions are completely dry, or the batter will run off of them and not stick.) Transfer one-third of the onion rings to the bowl with the batter, turning to coat each one. Once the oil reaches 350 degrees F, begin frying the onion rings, dropping them one at a time into the hot oil with a pair of tongs. Be sure not to overcrowd the pot, or they will stick together. Fry the onion rings for about 5 minutes, or until golden brown, flipping them over halfway through cooking. Using tongs, a slotted spatula or spoon, or a spider skimmer, remove the fried onion rings to the paper towel-lined baking sheet. Allow the oil to return to 350 degrees F and continue frying in batches. Season the onion rings with salt and pepper and serve immediately with ketchup or your favorite dipping sauce (see below). An ale or lager is recommended for the beer in this recipe. If you want to keep the onion rings warm before serving, heat the oven to 200 degrees and after draining and seasoning the onion rings, transfer them to the warmed oven. My favorite dipping sauce is this Outback Bloomin' Onion Dipping Sauce recipe. i finally broke out the deep fryer and gave these a go. i had trouble though. the batter was too thick and it needed a lot more beer, but then i added too much and the batter came out thin. will try again for sure though, just because this site is legit and the recipes are always great. i recently followed your plain bagel recipe and it was awesome. thanks for the hard work! Hi Rix, I have only made these with the fish and chips vinegar, so I can’t say how they would turn out using something else. I ended up buying cider vinegar and they were AMAZING! thanks for the recipe!!! Best recipe ever! Crispy, crunchy, full of flavor, I let them marinate just 30′ and was great, fried with canola oil, no smoke, but it catches heat very quickly, once the first batch starts frying, it ‘s better to reduce the heat a little bit so they became golden, not brown. I am almost always an onion rings person. I’m a french fries girl too but I also love a good onion ring. I order both whenever possible :D Ruth’s Chris serves theirs with this amazing Thai sweet and spicy sauce. It’s addicting. OOO!! I would much rather have onion rings than fries. And beer battered. Yes, Please. 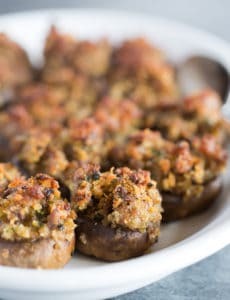 I’ve made the cook’s country recipe before and these are absolutely delicious! There’s no sharp onion bite and it wasn’t oily or heavy. It was sweet and super crispy. My sister asked me for the recipe so she can make it for another party she was going to! Wow! I love beer battered onion rings. Well ok, I love anything with beer! I’m a french fry girl, but only because I’m picky about my onion rings. If they are good onion rings, then I am THE onion ring girl. Yours look like absolute perfection! I want, I want! Oh my, these look good! I love french fries, too, but I’m always up for changing it up and having onion rings. These look to die for! Can you say gorgeous to an onion? Because this is simply beautiful! I haven’t had fried onions in forever! Like you I’m a french fry person, but onion rings once in a while is a yummy thing!! Oh goodness. I am not normally on anion girl, but these look real tempting!! I totally agree, baked onion rings make me feel better about my life choices, but honestly nothing compares to a fried onion ring. And don’t even get me started on Bloomin’ Onions. So delicious. I need these in my life now. Have you ever been to Tony Roma’s or other barbecue restaurant and had an onion loaf? You would be in heaven, I guarantee it. I haven’t! Sounds like I need to get thee to a BBQ joint and get an onion loaf! Well these look absolutely perfect. I haven’t had an onion ring for so long, i think I will have to rustle some up!